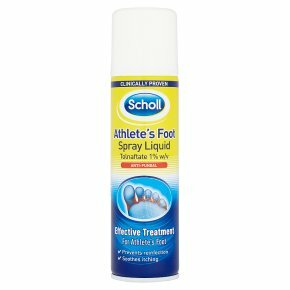 - Helps destroy Athlete's Foot fungi - Prevents reinfection - Contains Tolnaftate as an active ingredient - Relieves itching and prevents reinfection - Always read the label Scholl Athlete's Foot Spray Liquid Tolnaftate 1% w/v is a topical antifungal for the prevention and treatment of Athlete's Foot. Contains Tolnaftate, an antifungal medication to treat Athlete's Foot Fungi. How to use this spray Use this medicine only on your skin. Keep out of eyes. Wash and dry infected area and apply twice each day, or as directed by a doctor. Shake can well before use. Point nozzle towards affected area, holding 10-15cm away. Spray liberally over area. Wear clean socks or hoisery every day. Allow to dry before wearing shoes. Continue treatment for 2 weeks after symptoms disappear. If symptoms do not improve within 10 days, stop use and speak to your doctor.